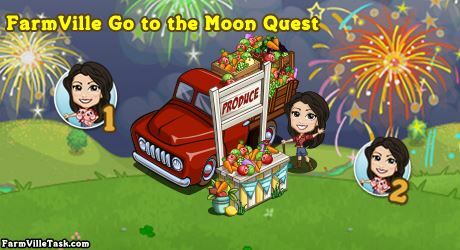 Our friend Sasha is joining us in this weeks FarmVille Go to the Moon Quest. She has just planned a line up of activities for this week and we will help her prepare tin shopping the things we need. On this week of FarmVille Quests, we will be crafting 9 recipes at the BAKERY, SPA and WINERY. Prepare ahead by collecting the bushels that we will use in crafting them. Note: Expected to be released Thursday (October 4). Quest Handicap: 1 – 1 = 1 amount to harvest. Info: Crafted at the WINERY and will need Rice Bushel x15 and Cranberry Bushel x9. Info: Crafted at the SPA and will need Yellow Marigold Bushel x9, Flax Bushel x9, Raspberry Bushel x3. Info: Crafted at the BAKERY and will need Grape Bushel x3, Blueberry Bushel x9 and Raspberry Bushel x9. Info: Crafted at the WINERY and will need Raspberry Bushel x6, Blueberry Bushel x6 and Sugar Cane Bushel x4. Info: Crafted at the SPA and will need Blueberry Bushel x6, Lilac Bushel x6 and Basil Bushel x4. Info: Crafted at the BAKERY and will need Blueberry Bushel x6, Blackberry Bushel x4 and Raspberry Bushel x6. Info: Crafted at the BAKERY and will need Blackberry Bushel x6, Grape Bushel x2 and White Grape Bushel x6. Info: Crafted at the SPA and will need Red Tulip Bushel x1, Aloe Vera Bushel x3 and Blackberry Bushel x3. Info: Crafted at the BAKERY and will need Zucchini Bushel x6, Red Wheat Bushel x2 and White Grape Bushel x6.